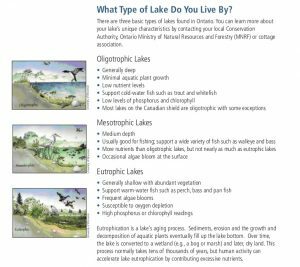 Updated: November 2016 – Eutrophication refers to excessive plant and algal growth due to the increased availability of nutrients such as phosphorus and nitrogen. Other factors such as sunlight and carbon dioxide may also contribute to eutrophication, but the impact of increased nutrient inputs is much greater. Eutrophication occurs naturally over centuries as lakes age and are filled in with sediments. However, human activities can accelerate the rate and extent of eutrophication. Increased phosphorus inputs from sources such as agricultural fertilizers or partially treated sewage are examples of human-induced eutrophication of freshwaters, also called cultural eutrophication. Depending on the state of eutrophication there can be dramatic consequences for aquatic ecosystems such as fish kills and blue-green algal blooms. 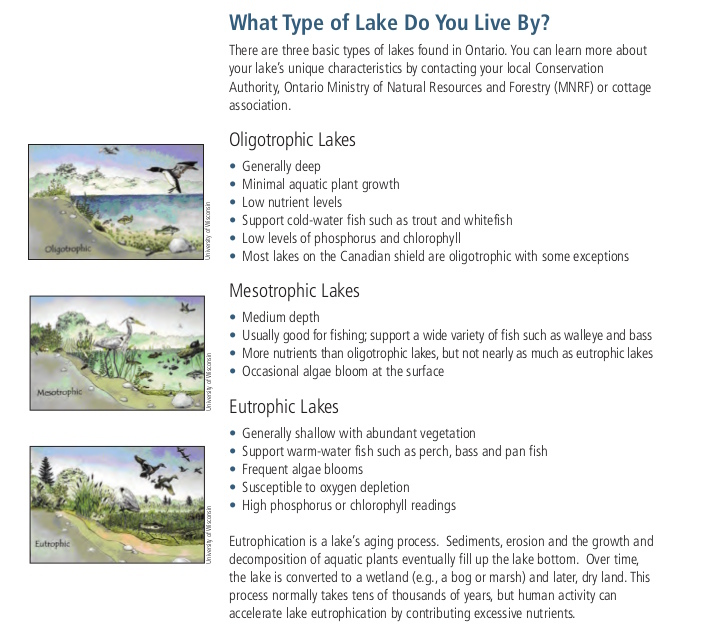 This reminds us why the Lake Partner Program and citizen science monitoring is so vital to maintaining the health of Ontario’s lakes.